Marsaxlokk’s monti hawkers are dead set against a move to close the open air market by 3pm. 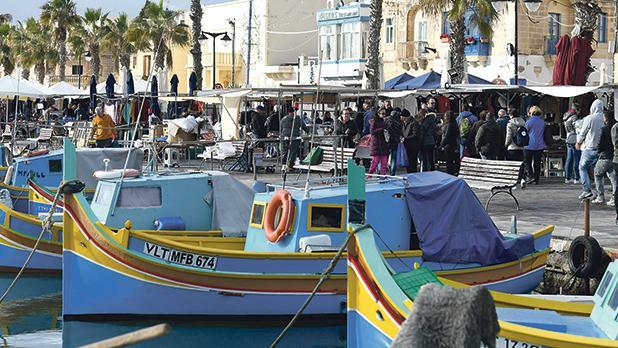 The association of open-air market sellers told the Times of Malta that some 300 families depended on the trade plied from the stalls along the Marsaxlokk waterfront and the curfew was a financial death sentence. “There are loads of families that depend on that market. Making sellers clear off by that time, just a few hours after tourists start arriving is madness,” an association member said. Marsaxlokk residents will this week vote in a referendum to have their say on whether the town’s seaside open market should have a strict closing time or not. Mayor Horace Gauci said the vote would be held to decide on whether the monti should be made to close at 3pm, giving cleaners enough time to tidy up the mess left behind from the market stalls and still allow residents to enjoy a sunset stroll or other outdoor activities. “Today we have a situation where the stalls close up at sunset, and by that time the promenade is clear of stalls there is a mess and no one can enjoy the area,” he said. The mayor said the Marsaxlokk local council had recently reached a unanimous agreement that the Sunday open market along the wharf should be closed by no later than 3pm. Meanwhile, the hawkers’ association met yesterday after reading the reports of the planned vote. “We were not informed and had no idea this was going to be happening so soon,” one seller said. He later added that a meeting was being scheduled with the local council later this week. “Tourists normally start arriving after noon. If we are made to clear shortly after that, there will be no time for us to make any sales,” another seller said. The referendum is set to be held this Saturday, with polls open between 7am and 7pm at the local council offices. Meanwhile, according to Mr Gauci, a preliminary poll has already found that most sellers had in fact agreed with the need for a strict cut off time. And, although some had raised concerns that forcing them to close at 3pm would affect sales, the council noted that most markets ended by not much later than 1pm. Asked how residents felt about the situation, Mr Gauci said the council had not conducted any surveys among those living in the area. However, the decision to go for a referendum was based on feedback and complaints that local councillors had received over the years. The government has launched a White Paper on open markets and is receiving feedback from stakeholders until February. Mr Gauci said the local council agreed with all the points raised in the government’s document other than the times being set. The council is adamant that stalls should be put away by the afternoon to give enough for the promenade to be cleaned and enjoyed by residents and the public.